Click to watch Andrew Fischer discuss his activity or watch the full webinar. Remote sensing is a cost-effective way to gather data about environmental conditions and can be used to understand variability and trends. In this exercise will start to gather environmental data for the Tasman Sea, particularly chlorophyll concentrations and temperature of the surface of the ocean. By visualizing these data we can view annual changes to important parameters of the environment and begin to make more informed assessment management decisions. Through this exercise students will be introduced to the concepts of remote sensing, ocean color and using MATLAB to import and manipulate and visualize scientific datasets. Students are guided through a command lines and script development in the MATLAB environment to 1) download ocean color data, 2) import data, 3) sub-scene the global data set into an area of interest and 4) plot annual averages within the identified "sub-scened" area. This activity is meant to serve as an introduction to using MATLAB with ocean color data. Some synthesis of ideas and critical thinking is required when students are requested to apply the scripted lesson to another dataset of sea surface temperature. This is a computer lab activity that will take approximately 2 hours or longer, depending on year specific efficiency and individual capabilities of the students. Students are then challenged to repeat the process they have just completed, utilizing a different data set. The exercise was designed for students that do not have any prior experience in MATLAB. Additional resources (e.g. Attaway text) are provided to students so that they can become more familiar with MATLAB before undertaking this activity. Students should be familiar with the concept of a matrix, though they are not required to have had Linear Algebra. This exercise is given in a course called Ecosystem Assessment. We go through a series of exercises and case studies, where students gather environmental data about a particular marine ecosystem and align data collection and analysis with an ecosystem-based management plan. 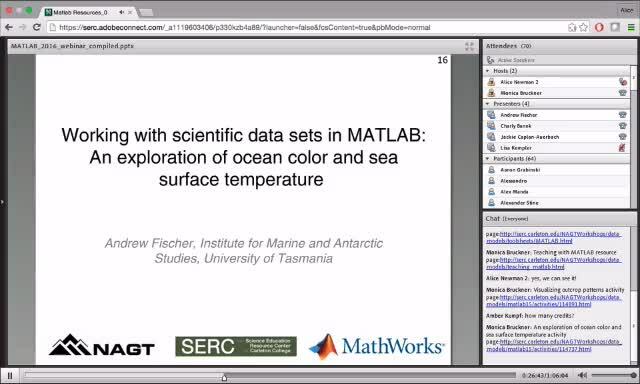 A full description of this activity is included in the attached file, "Working with Scientific Data Sets in MATLAB: An Exploration of Ocean Color and Sea Surface Temperature." In this activity, students are guided through a series of steps including (1) accessing online ocean color data, (2) reading and georeferencing the data with MATLAB, (3) sub-setting the data, (4) plotting, and (5) creating a batch script to repeat the above steps on multiple files. With each step, students are asked specific questions to help them understand the data sets they are working with and the purpose of the MATLAB commands and functions they are implementing. At the end of the guided activity, students are presented with an assessed challenge task. This tasks involves performing the same set of steps using a sea surface temperature data set. The activity assumes that the College or University has a MATLAB license that students can access. Data for this activity are freely available and easy to download from the supplied websites. This exercise is not posted anywhere else and has not yet been thoroughly evaluated and tested. In the challenge task most students have problems with the directory structure and reading the in a different set of variables from the netCDF file. The students also need to be careful with adjusting the matrix size, the color scale values (very different for temperature) and pointing Matlab to the correct directory for loading the appropriate files. To overcome many of the above difficulties the activity is run for small groups (<15) allowing the instructor to give the students individual attention. Students are also encouraged to work with one another but are required to submit their own work. Upon completion of the guided and challenge tasks students provide plots of annual averaged ocean color, or chlorophyll (2002-2015) and sea surface temperature (1981-2012) for inclusion into a ecosystem based management report. They use this data to describe chlorophyll and temperature patterns in their chosen region and try to determine what is causing this inter annual change. Both the guided and challenge tasks are assessed with the attached grading rubric.